Courtney Weisse ’17 is leading the Big Green in goals and points this season. Courtney Weisse ’17, an attacker on the women’s lacrosse team, leads the Big Green with 34 goals and 38 points this season. Weisse has scored at least one goal in every game this season and has scored five goals on three occasions, most recently on Saturday versus Cornell University. CW: When I was doing the recruiting circuit for lacrosse, I went to a lot of different schools. I wasn’t really thinking necessarily about Dartmouth originally, but [former head coach] Amy Patton recruited me here. I came up for camp, the fall Columbus Day camp, my junior year of high school, and I fell in love with the school. I fell in love with the team specifically — it had such a different feel. It’s funny I was driving home, and I said to my parents, “This is it, this is the school for me.” It really just felt right. I think it had a lot to do with [Dartmouth’s] traditions and the sense of community that drew me in. What was the transition to collegiate lacrosse like, and how is it different from your high school experience? CW: The game was so much faster. The transition game, the speed of the play, the passing — everything was faster, but I felt pretty good strength-wise. I lifted in high school so I thought coming in that was something that really helped. There were people who were a lot faster and a lot stronger, but I felt like I was definitely comparable with strength. Also, the time commitment, but that was kind of a given. I think it really was just the speed of the game, everything was faster. Your decision making had to be very quick and calculated so I would say the speed was the biggest change. What can you tell us about your pre-game rituals? CW: When I started the recruiting circuit, I don’t know why, but I started eating Chinese food the night before games. It sounds really weird, but it just became a superstitious kind of thing. Coming in, I kept it my freshman year, but it was kind of hard for weight checks so my dad would bring me like a dumpling or something silly like that. I have actually broken that ritual and developed new rituals. That was something that worked in high school. It’s just too hard to do here, so I developed other rituals — like putting on my shoes in a certain order or the night before doing a full body roll-out stretch. What has it been like filling the shoes of Jaclyn Leto ’16, who led Dartmouth in scoring last year, as team leader? Has that affected your performance in anyway? CW: We miss Jaclyn so much because she was such an amazing player, but I’ve taken on a bit of a different role this year. I’ve been playing on the inside of the offense, so I’ve been taking on this role of specifically being a cutter and a finisher in that sense. I’m not necessarily a dodger but more on the inside, and that’s more of a different role that I’ve taken on, whereas in previous years I played more behind the cage and [did] a lot of assisting so definitely a different role that I’ve been put into, but head coach Danielle Spencer saw something in me to put me on the inside, and I really like it. It allows me to maneuver my body really well and work based on what the defense gives me. It has been exciting; I think it is so good to not think about it as that big of a change, just a positional change. Tell us about your experience playing under Spencer. How is it different from previous years? CW: I think Danielle is an amazing coach, and she’s done a really great job in her first year here. It’s not necessarily different from years past — it’s just as intense and demanding as any year. I think that it’s been a different experience, and we’re just going with it and taking advantage of every opportunity we are given to play this sport. How has Spencer’s coaching style and philosophy affected you and your playing? CW: She definitely loves to play fast and really attack the defense and not really wait to create offense for each other. It’s been really fun to play under her philosophy where we push the boundaries and see what we are capable of doing. She really likes to see what people’s strengths are, sometimes in ways we never thought of before. She likes to see where she can best fit people. It’s like a giant puzzle so she is trying to see what pieces she can play to these people’s strengths. What has your experience been like balancing lacrosse, school and personal lives, especially when you’re traveling so much? CW: I think at this point, I feel like I have it down. It’s definitely hard missing school, but we are always on top of it with our professors. It requires a lot of time management and work outside of the classroom to make sure we aren’t slacking in that because obviously it is our first priority. In my personal life, I always plan dinners because that is usually a time I can meet up with friends. The team has definitely been playing a ton so taking care of our bodies, putting our school and athletics first in that sense — making sure we are sleeping enough or eating well and recovering — that’s been the hardest part. What can you say about the team’s recent performance? What can we expect going forward? CW: I think we learned, especially from this past Wednesday, that we can really play with anyone, and it gave us a little bit of confidence going into it. I think we are very well prepared. It just comes down to having confidence and really attacking it. We are the underdogs right now, but I think we will take a lot of people by surprise because we are a very talented team. We just need to put all of the pieces together and play the full 60 minutes. Coming to the end of your senior year and collegiate lacrosse career, what achievement from time here at Dartmouth are you particularly proud of? CW: I am really so proud of being on this lacrosse team and learning so many different skills and having so many different experiences. When you’re on a team with 30 girls, you learn how to manage things very well, and it pushes you very far. It definitely hasn’t been an easy year, in the sense of switching up coaching staff, but that has taught me so much. Do you have any last words or advice to give from your experience on the lacrosse team? CW: I think it’s always remembering why you were recruited or why you are at Dartmouth. 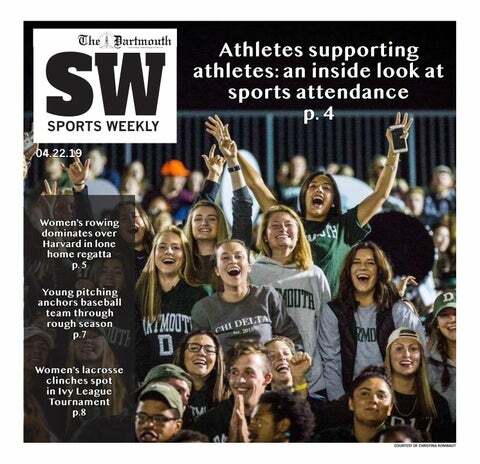 Yes, we are here for academics first and foremost, but most of us were recruited so going back to that and remembering how amazing of an opportunity this is and to take advantage of everything you can on the field, in the classroom, and within the community at Dartmouth — there really is so much. Time flies by so don’t get too consumed by a term. Really enjoy it because before you know it, it’s gone.